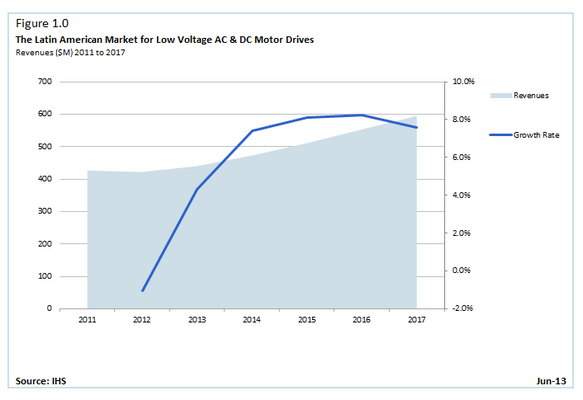 The Latin American market for low-voltage AC & DC motor drives is forecast to expand to $595 million in 2017, rising at a compound annual growth rate (CAGR) of 7.1 percent from $420 million in 2012. Latin American low-voltage AC & DC motor drive sales grew at double-digit rates in 2010 and 2011, according to a recently released report entitled "The Latin American Market for Low Voltage AC & DC Motor Drives" by IMS Research, now part of IHS Inc. However, drive sales in 2012 declined by 1 percent, and growth ahead won't be as expansive. "The years of double-digit growth rates for Latin America are most likely a thing of the past," said Rolando Campos, motor drive and motion control research analyst for IHS. "As demand for commodities from China moderates and mining projects are delayed, drive sales will grow by about 7 percent annually through 2017. The path to higher growth rates, however, will not be a straight line and growth rates will vary widely by country." Because of lower commodity prices, many material extraction projects and expansions have been delayed. According to IHS Global Insight, commodity prices for rubber, pulp, chemicals, oil, non-ferrous metals declined by 15 to 40 percent from March 2011 to March 2013. Precious metal prices, particularly gold, also have fallen.